I was taught to never underestimate the White Mountains; they are a force that some people have had the misfortune of not taking seriously. Even in summer you will find snow on Mount Washington. This is my experience with hypothermia. “Hypothermia is often caused by exposure to cold weather or immersion in cold water. It occurs when your body loses heat faster than it can produce heat, causing a dangerously low body temperature falling below 95 F (35 C). In mid-June my brother and I made our way to New Hampshire to tackle a two-day hike. We parked at Zealand trailhead with plans to summit Zeacliff, overnight at Ethan Pond, and come back the next day. We double-checked weather at the hut and were met with reports of clear skies and lower temps. No problem; I thought I was prepared for that. So off we went ready for the eight miles to Ethan Pond. Over halfway there, it began to rain. Fine. I actually like hiking in the rain. I started to feel cold, but I was moving so I wasn’t concerned. Plus, I had dry camp clothes. At camp, we chose to set up one tent in an attempt to stay warmer. We ate and went to bed. It was the wind that initially woke me up, then the cold. My bag was not keeping me warm enough and my rookie mistake is as follows. I pulled out an emergency blanket and wrapped it around my torso, proceeding to sleep a fitful 20 minutes before waking up shivering. I had begun sweating in my bag and I was now colder than ever. Cut to a sleepless night wishing I was anywhere else. Thanks go out to my brother for thinking straight. Getting me out of my bag, into his, and trying to air out my sweaty one. The next morning we were confronted with either hiking the near ten miles back to the parking lot, or the two-something miles to Route 302 into Crawford Notch. At this point it’s worth mentioning that I was feeling weak and sleepy, I started mumbling my sentences, and I was still very cold. Then halfway down the mountain I began stumbling on the eroded trail. We had a lucky hitch in the form of a national park employee, who proceeded to make us feel better by telling us that the storm had been unexpected and they even closed Mount Washington. I was lucky in terms of where were were on trail. How easy it had been to reach a road, and the lifesaving bag of warm clothes I left in my car. I will never underestimate the power of a good sleeping bag again. Mine was rated for 30 degrees, but it was an older bag and designed to keep me alive, not comfortable. Now I have a 15 degree Nemo Rave, which has kept me comfortable in weather that dropped to 15 degrees. A little weight for comfort is something I’ve found I’m willing to deal with. I’ll also hike with rain pants in lower temps. 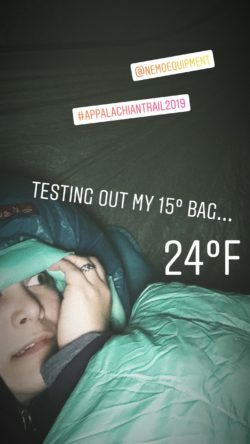 I believe that I was already cold hiking up to the campsite, and sleeping cold didn’t help my already lowered body temp. Heading into Georgia in mid March, I’ve been told not to worry. Maybe the Smokies will be cold, but you’ll be fine. Personally, I would prefer to err on the side of caution until hot nights at lower elevations allow me to shuck some winter weight. Then I’ll pack it back up for New Hampshire and Maine. Better to be alive than cold. I think I’ll trust me on this one. Just a Boston girl with a love for the mountains. I've been working in childcare since I was 17 and I feel the need for a career change. Since The Appalachian Trail has been on my 'bucket list' for years, I knew I needed to take advantage of this transition time in my life and hike, or it just wouldn't happen. I'm looking forward to seeing the mountains in the south-east as my only backpacking experience lies in the White Mountains of NH. I know this will be hard, but I'm so ready for the challenge. My plan is a solo NOBO thru-hike in mid-to-late March, and I'm so excited to see where this adventure takes me. How did you go from shivering in your bag to sweating in your bag without getting warm? When you sweat on a cold night it really can be dangerous. The cold air causes your wet body to shiver as though you had been swimming. If I had stayed cold but dry, it would have been a miserable night, but maybe I wouldn’t have experienced hypothermia to the extent that I did. The southern Appalachians can be very cold and wet in March. Especially above 3000 feet. It is very wise to not under-estimate the southern range in the spring. It’s cold and wet. We got snowed on several times and then ended up on Roan Mtn on the coldest day of the year. You can always, *always* mail your heavy cold stuff back to friends/family when you no longer need it. For us, it was about the time we hit Virginia.